When we booked, we requested a pitch as near to the Loch as possible, however those on the loch side had already been booked. The wardens were very helpful and suggested that we might like to stay on an unmarked pitching area close to the loch side; the area was partly covered in hardstanding but was classed as grass pitches. It was rather shaded by the overhanging trees but we liked it because of its close proximity to, and rather spectacular views over, the Loch. We spent Monday 2 April resting after our long journey, and as the weather was rather dull we stayed in and watched the TV and read. TV reception with our van’s built-in Status 530 aerial was rather poor due to the trees overhanging our pitch. As an alternative, I spent a lot of time trying to get a signal on our satellite system but again the trees proved to be a problem. On Tuesday 3 April, as the weather forecast was rather poor, we asked about the possibility of moving to another pitch with better TV reception. After a helpful discussion with the wardens we were allowed to move just a few metres, within the same pitching area, nearer to the slipway. The break in the trees for the path accessing the slipway gave us a “window” which enabled us to obtain a satellite signal. 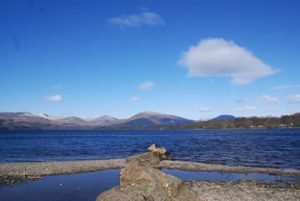 On Wednesday 4 April the weather was brighter and we took what turned out to be one of our favourite walks along the shores of the Loch to the small village of Balmaha, and then back again. This path is part of the West Highland Way which passes by the gates of the campsite. The path followed the shores of the Loch and we were able to spend time sitting on the beach in the sunshine en route. Just before reaching Balmaha, we passed the Balmaha cruise and ferry landing pier, spending some time watching the “Cruise Loch Lomond” ferry from Luss arrive and depart. A little beyond the Pier we joined the Millennium Forest Trail and climbed the stepped path to the viewpoint at Craigie Fort. This viewpoint gave spectacular views over the Loch and northward to the mountains beyond, and in other directions too. Continuing on to Balmaha we enjoyed a very pleasant lunch at the “Oak Tree Inn” in the centre of the village. The restaurant was very busy and so we opted to sit outside in the adjacent beer garden. We enjoyed a very pleasant meal of beautifully tasty home-made beef burgers and chips, although for a bar meal it was quite expensive at c£10 each. The beer garden would have been more pleasant if there had not been builders working on an extension to the Inn very close by. After lunch we returned by the reverse of our outward walk, although we did omit the climb to Craigie Fort. We followed the banks of the Loch and enjoyed the changing vista. At the southern end of Milarrochy Bay itself, we paused to visit the small visitor centre and the toilets there. There is also a public slipway for boat launching and a car park. On Thursday 5 April we drove into Balloch for a look around. We visited the Tourist Information Office in the centre of the town which was very informative, plus the staff were very helpful and knowledgeable. 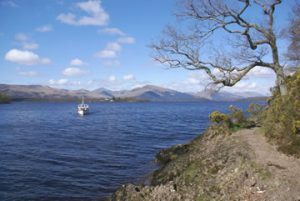 In addition there is the Lomond Shores shopping “experience” on the shores of Loch Lomond. In my opinion Lomond Woods is a rather ugly building with rather overpriced “designer” shops and a small department store aimed at the tourist trade. It is, however, apparently built on a reclaimed industrial site and so is probably an improvement on that! It has an absolutely huge car park. Adjacent to the Lomond Shores complex is a SeaWorld Centre but we didn’t visit. A short walk along the Loch shore at Balloch Pier is the historic steamer, “Maid of the Loch”. This paddle steamer was the last of the Loch Lomond paddle steamers that was launched in 1953, after being re-assembled at Balloch. 1953 is the year I was born! The ship last sailed in 1981 and is now being restored by a group of enthusiasts who hope she will again cruise on the Loch. “Maid of the Loch” is open to visitors every day from Easter to October and is an interesting ship to visit. After we had looked around Balloch and visited Lomond Woods we took the opportunity to stop off at the Co-op supermarket to buy some provisions. The Co-op was well stocked with a wide variety of goods including some local specialities. Before driving back we filled up the car with diesel at the local Shell petrol station which was the cheapest in the area. Opposite the petrol station there is a fish and chip shop which we visited several times during our stay. When travelling back to the campsite at the end of the day we decided to take an exploratory drive, continuing along the eastern side of the lake beyond our campsite. The road from Balmaha continues for a further 5 miles beyond the Milarrochy Bay Campsite before ending at Rowardennan. On the way we drove past a Forestry Centre but we did not visit. The road to Rowardennan is narrow and quiet with just a few farms and the Cashel Club site en route. There is not much at Rowardennan; just a hotel, a National Park Centre with toilets, a car park and a Youth Hostel. 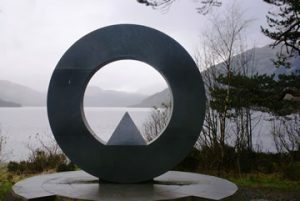 There is also an unusual ring-shaped monument which gave an interesting and novel frame to the northward views along the Loch. On this dark and cloudy evening the lovely, brooding views over the Loch to the mountains to the north were superb. Rowardennan is also the starting point for those who wish to climb Ben Lomond. Ben Lomond is Scotland’s most southerly Munro, ie, a Scottish mountain over 3,000 feet.